My idea to start this blog actually started while I was sitting eating dinner in Singapore. My sister and I spent almost two weeks there explore the tiny country. I’ve always heard Singapore described as expensive and “just” being a big city like many others. The thing that I’ve heard people talk positively about is their Airport. So here we were sitting on one of our last days and I felt I had a completely different picture of Singapore than before I arrived. There’s more to Singapore than that, and there’s things to do even on a budget. I’m not going to say that Singapore isn’t expensive (by Danish standards), because a trip to a local grocery store will show you it is. Singapore is an expensive place to live, but it’s not impossible to do things there on budget as a tourist. Or eat. A cheaper place to go get lunch is going to some of the food courts that are located around the city. We really enjoyed going to the food street in Chinatown, where we could get a good meal with soup from one of the food carts at a price of around 4 SD (Singapore Dollars). We would then sit down at one of the many tables and eat, while planning where to go next or people watch. They have free wi-fi there, which made it an ideal place if we needed to check how to get somewhere or other practical things. The food court also had this fun mix of tourists trying out the various Asian-styled dishes, and locals having their lunch before going back to work. Our evening out, we were planning to see the sunset from the ION Sky and decided to eat somewhere close. We ended up finding a place inside the ION Orchard called The Soup Spoon. We got a meal with both soup and sandwich, with some delicious soups. For just over 11 SD we got food and drink for two. The food was lovely, even though we never got to see the sunset from the ION Sky. Turned out there was a private function going on and it was closed earlier than normal. Sometimes you’re just unlucky, but we found somewhere else to enjoy the evening. Of course travelling is more than just eating, though that part is part of the experience. We went to several places that didn’t cost a thing, some of them we found perusing this link. 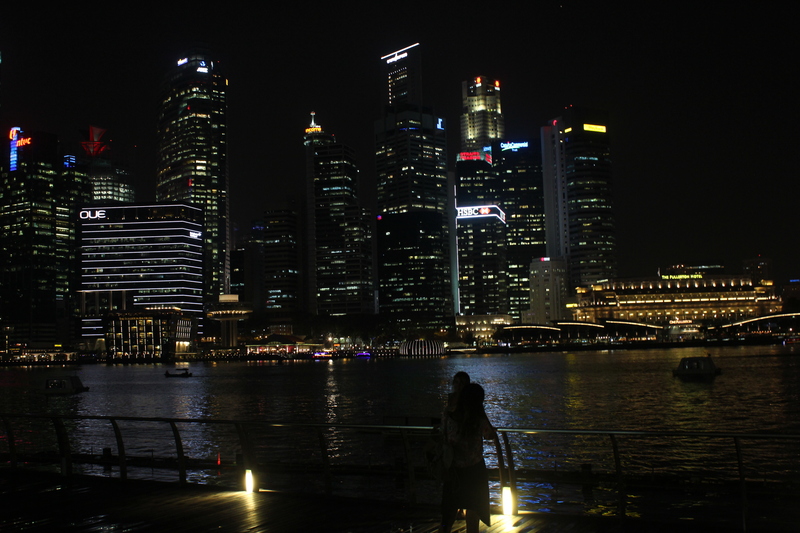 It’s worth taking a look, if you’re thinking of going to Singapore. It mentions places like the Haw Paw Villa (Tiger Balm gardens) which gives you an insight into Chinese religion, the Southern Ridges with its walk near the treetops, and gardens by the bay. 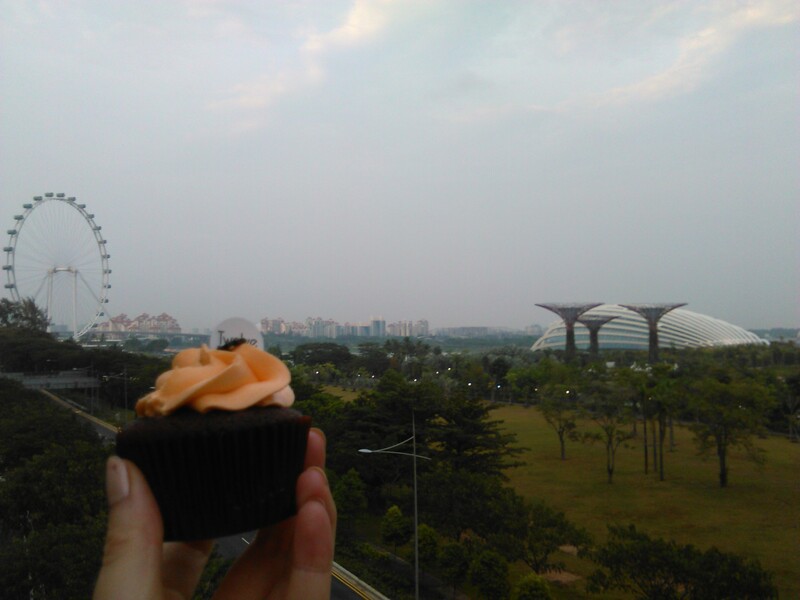 Having bought cupcakes for our dessert, we went to the bridge between the Marina Bay Sands and the Gardens by the Bay to eat them with a nice view. Afterwards we found our way up to a sort of ”sky garden” on the Marina Bay Sands Shopping Center, where we could look out over the bay. We took an escalator up to something that looked like a fine hotel or casino, and then onwards up another escalator to find the doors that led out. I felt a bit out-of-place searching for the door out. After watching the sun set, we walked down to sit by the bay outside the shopping center. Here we found loads of people and we sat to join them. All of a sudden we heard music, and then a water, light and music show started over the bay. A very pleasant surprise and end to our evening.